The Sapphire rocket was launched on June 23rd 2013. It is a single stage hybrid rocket using a solid seven-port polyurethane fuel grain oxidized by nitrous oxide. With a Gross Lift-Off Weight of 202.7 kg it is the smallest rocket ever launched by CS. It is however one of the more advanced rockets we have ever build. 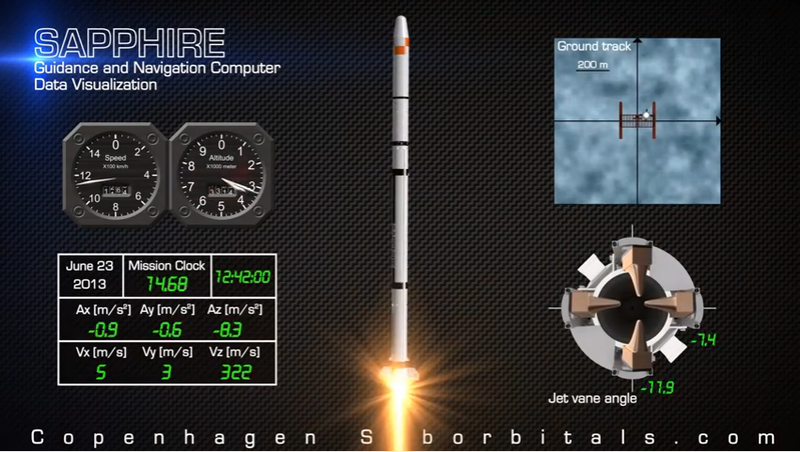 The primary purpose of the Sapphire mission was to develop a navigation and thrust vectoring system capable of keeping the rocket on the correct trajectory. 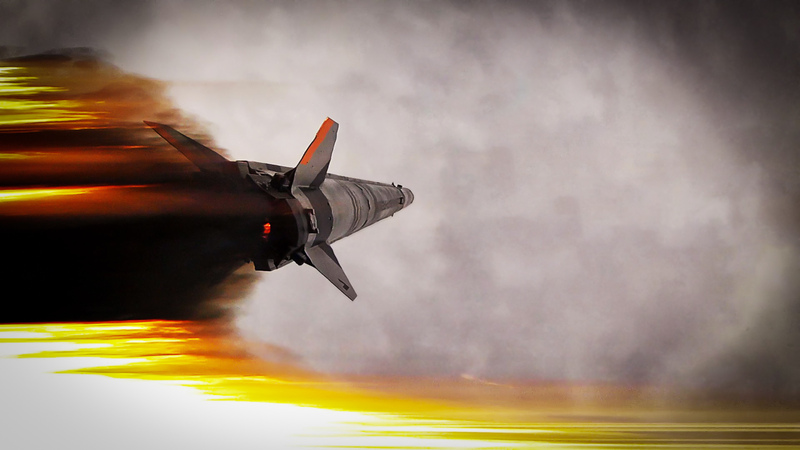 Navigation is provided by a custom built navigation computer utilizing a 3-axis accelerometer and 3-axis gyroscope and thrust vector control is obtained by using a set of four servo-mounted copper jet vanes partially inserted into the rocket motor exhaust. The Sapphire rocket was launched on June 23rd 2013 from Mobile Launch Platform (MLP) Sputnik in the Baltic Sea. Trajectory control was implemented in such a way that the Guidance and Navigation Computer would aim at a point in space directly above the rocket at the moment of lift off. 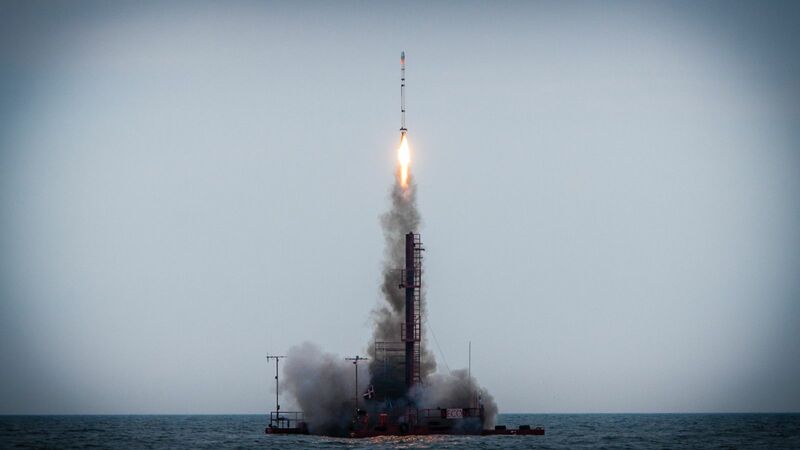 The rocket reached a maximum speed of 344 m/s (Mach 1.03) and apogee occurred at an altitude of 8253 m. During flight the guidance and thrust vector control performed admirably. As the engine burned out after 20 seconds the rocket was just 90 meter off target and at apogee it was 191 meter off. 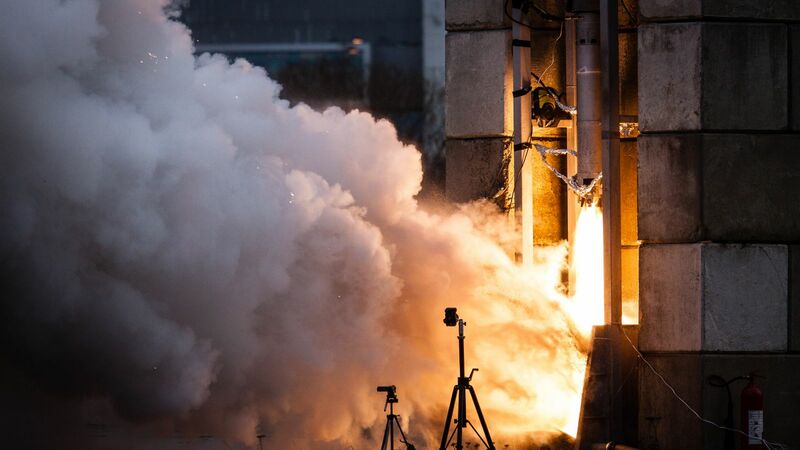 This being our first attempt of guidance and thrust vector control, it is a far better result than expected, and it paved the way for thrust vector control of the Nexø I rocket launched in 2016. During flight all important sensor parameters are down linked to Mission Control. Based on these data we have created a data driven visualization of the flight. The Sapphire rocket is based on CS’s proven polyurethane/liquid nitrous oxide hybrid rocket engine technology. It is based on a valveless design where the injector is capped off with a set of plugs held in place by a number of strings. As a pyrotechnic charge inside the combustion chamber is ignited, it rapidly burns through the strings and releases the plugs such that nitrous oxide is injected to oxidize the combustion. The vehicle consists of many components. Just below the nose cone is a parachute and an inflatable floatation device. Below this is the avionics compartment housing the Guidance and Navigation Computer (GNC), GPS device and down-link radio. Below follows the nitrous oxide tank, the combustion chamber, nozzle and finally the jet vane assembly. Total lift off mass is 202.7 kg of which 58.1 kg is propellant. The total length is 5.38 m and the body diameter is 22 cm. Engine burn time is about 21 seconds in which the engine delivers a total impulse of 103,000 Ns. As the hybrid engine used on the Sapphire rocket is based on a thoroughly tested design, development of the Sapphire rocket mostly consisted of development of the Guidance and Navigation Computer system and the jet vane control system. 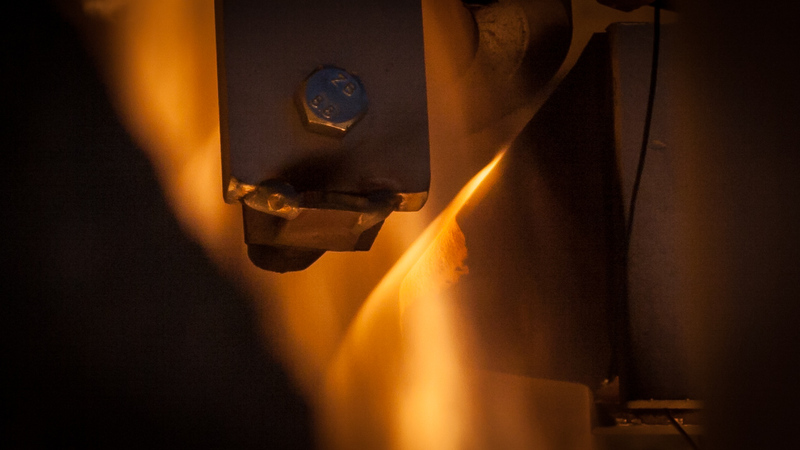 As the jet vanes are inserted directly into the exhaust they must be able to survive the extreme conditions and high temperature they operate in. For the Sapphire rocket the jet vanes were made of copper and were intentionally made large enough to simply absorb the heat without melting. It is no simple matter to calculate the force excerted on a jet vane from the exhaust of a hybrid rocket engine, it is however of utmost importance for the control system to know this, in order to apply the correct jet vane deflection as a response to a necessary trajectory correction. Thus, a full scale static test was performed on December 30th 2011, where the jet vane forces were measured as a function of deflection angle and engine pressure (which varies during the burn).